Financial engineering, part one – Who’da thunk that POTUS would weigh in via (of course) tweet on the idea of abolishing quarterly reporting (in favor of 2X/year as in much of Europe and Australia). Who knew he cared? Now, my partisan hat forces me to note that this was a cause dear the heart of the last Democratic Presidential candidate, but what the heck – they’re both wrong in my opinion. No industry is more concerned with short vs long term thinking than rails (see “OR, Cult of”, above), given the 10-50 year horizons of their massive capital expenditures but we have to ask ourselves, as grown-ups….is it the quarterly reporting that causes short termism, or how the data is used? Is the financial information, meant (and used by me) as a snapshot update on a company’s long term strategic plans and performance, like, say, tobacco or a Class A drug and must be limited or even banned? Or is it like beer, the staff of life, and should be taken in moderation (and be up to the consumer how it’s used)? Put another way, after the ravages on research from Reg FD (don’t get me started) and now, MIFID II, do we really want less available information? Perhaps less guidance will lead to less game playing….I love the WSJ headline: “Money Managers Give (the tweet) Mixed Reviews”); and how. NAFTA news – Although POTUS said last week that there was “no rush” on NAFTA, the USA and Mexico are supposedly close to a deal – but where’s (you remember, the big country up North) Canada? Says POTUS: “we’re not even talking to them”. In my non-RR analyst opinion, I frankly cannot believe that Mexico is playing it this way. But getting resolution is paramount, and there are political reasons on both sides of the southern border to move quickly. In all likelihood, the reporting is ahead of the facts on the ground. From a rail perspective, a deal with Mexico is more important than one with Canada - but free trade is a good thing for transportation overall, of course. Meanwhile, a Chinese trade delegation arrives in the USA this week…. Coal part two - The EPA moves to further rollback (CPP) C02 emissions restrictions on coal-fired utilities, with new rules that could “include measures that could push (meaning: force) utilities to invest in their coal fired plants to make them more efficient and competitive” (FT); before we get to all thinking that “coal is back” remember the market rules (see gas, natural) and that this effort will face a long court fight likely lasting into the next administration….which might, just might, have different environmental policies, who knows? How would you define the current state of the rail carload market? The rail market is characterized by strong demand, and ongoing issues of available capacity due in part to less than ideal levels of service (constraining all modes, to be fair). It’s sort of a chicken and egg thing – there’s pockets of rail capacity shortage causing service issues, and there’s poor rail service (lower network velocity and higher terminal dwell, etc) that is reducing available capacity. It’s not a “crisis” by any means, but it is an “issue”…. Carload volumes look solid overall and are up 3.5% annually through July, according to AAR data. How do things look for volumes over the remainder of 2018 and into 2019? Carload volumes look bright for the intermediate future – barring any worsening of a trade war of sudden decline in the health of the overall economy. The secular stories in Ag, energy, plastics, and refined products to Mexico all should do well in almost any environment – providing we leave well enough alone…. Looking at intermodal volumes, both international and domestic are on solid footing in terms of growth. What are the key factors behind this growth in your opinion? 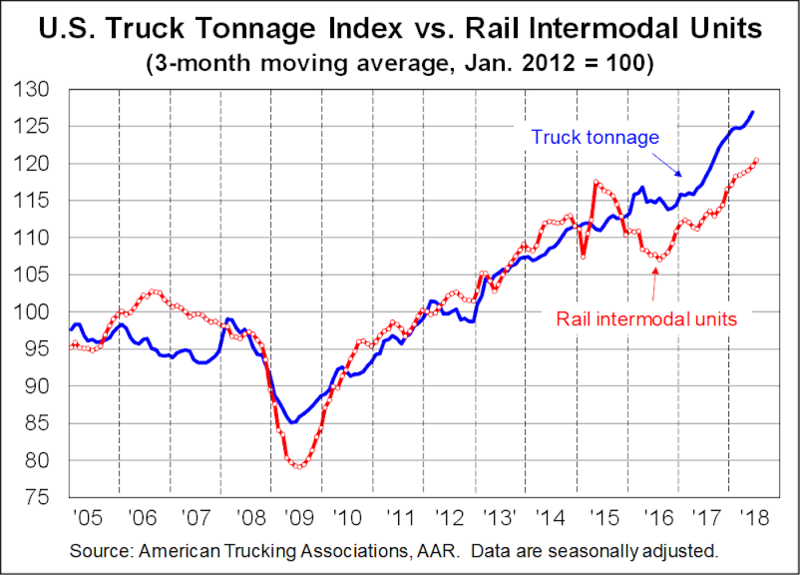 International intermodal reflects string consumer spending and perhaps the near term win of the tax cut effect over the tariff impact – I am not sure that sustainable at this pace. But it’s worth noting that big-box retailers, once the leaders of the pack, then considered dinosaurs – are doing quite well this summer, thank you very much. Domestically, domestic volumes were up almost 8% in the first six months (IANA) – and for that you can thank the combined impacts of the string, tax-cut fueled economy, the well-known driver shortage (and other highway issues), the positive (yep) impact of ecommerce (the so-called “Amazon effect”), and the ongoing secular trend favoring intermodal. That said, the 6% half-year growth rate of domestic containers is on-trend – given the state of the truck-load industry, it should have been well above trend, but for those issues of service and capacity. Will we look back on this period as the jump start to the next wave of IM share growth, or a gigantic missed opportunity? The digital economy continues to make an ongoing impact on smaller shipments and faster, more reliable service. That said, how does that impact rail and intermodal operations? It’s not clear yet, obviously, and that phrase sounds scary (smaller, faster, more reliable) to anyone with three decades following rails….but….Amazon has a direct relationship with most if not all of the railroads. And the fastest growing unit within IM is the left-for-dead 28’ pup trailer – it grew 23% YOY in Q2/18. Railroad service has been under the microscope for a while now. How do you view the current railroad service levels on a year-to-date basis? Year-over-year trends have been disappointing for 18 months now. We know why CSX suffered (self-immolation in the “PSR Revolution” – but they’re now at the top of the leaderboard. And we know why CN suffered (planned on +5% growth last year, as did their key BC port partners – and got +10%). But they spent the money and put a plan in place that is already showing results. Why did the others deteriorate? The move to longer trains? Shouldn’t be that. The reduction in 2016-17 in capex levels? They didn’t cut back on network (MoW) spend. So what is it? The carriers haven’t adequately explained themselves – and it has led to some job reshuffling (and “early retirements”). Perhaps it’s the “Cult of the OR” – the short-term thinking leading to running an operation too close to the bone…. What is the outlook for rail carload pricing compared to the beginning of the year? Have things changed, or are they within—or meeting—expectations? Despite sub-par service (remember this is no “crisis”), rails will get their so-called “rail-inflation plus” pricing, on the upper end of the +3-4% annual rate range…. Given the ongoing tight capacity and driver shortage issues the truckload market is up against, have railroad carriers and IMCs been able to successfully taken advantage of the situation? If they haven’t, then why is that the case? Asked, and answered – for now. Rail service does seem to be improving – maybe it’s too early to call a general inflection but it seems to be so at CSX, CN, even NS….If so there’s still some time before the inevitable slowdown. This isn’t just about making hay now, it is about reputation with shippers (and regulators/politicians) that can help with secular share change. How do you view the current state of rail policy as it relates to things like the Surface Transportation Board’s ongoing quest for reciprocal switching, the possibility of railroad re-regulation, and PTC? It is important to point out the (undermanned) STB isn’t questing for anything – but it is reviewing suggestions from the NITL and other trade associations looking to lever their position in an ongoing (and historic) economic battle. The STB doesn’t have opinions on this – or they shouldn’t, anyway. PTC is moving, perhaps a bit slowly, form the “unfunded mandate” to becoming the “backbone of the future digital railroad”, as NS said at RailTrends last winter. 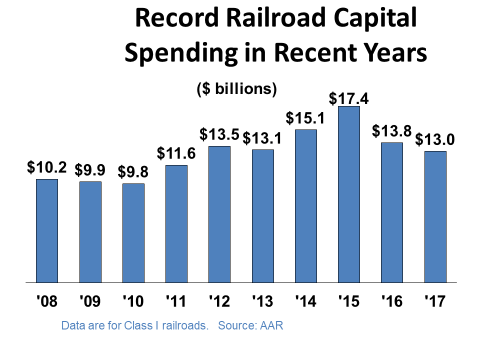 What would you say would be on your wish list for the biggest gains and advancements in the railroad and intermodal sectors over the next few years? The rails need to “fix’ the current service issue – but what they really need to do, and they seem to acknowledge this (see PTC, above) is up their game in technology – from a MoW perspective, from a visibility/.ease of doing business perspective, etc - because though AV trucks aren’t showing up anytime real soon, with all of the Silicon Valley money out there, we need to be sounding the alarm - winter is coming…. Australia & Rails (ETC) Update: High Noon for Over-Regulation?